A writer in India has responded to the #MeToo movement with an admission of his own impropriety towards a woman. Using the hashtag #IDidThat, Devang Pathak in Mumbai posted: "It wasn't easy to write but here it is. I am sorry and I will do better. #IDidThat". "I'd love to see a counter trend of men posting 'I'm sorry and I'll do better' if they feel they've ever made a woman uncomfortable, unheard or unsafe. This one's on you, dudes, and yet I still see all the mobilisation and conversational labour being held by woman." "This has been playing on my mind since the Harvey Weinstein story surfaced as well as the domestic revelations and conversations in India," Devang told the BBC. "I saw the me too conversation and saw Rega's comment on my timeline. I hope more men share their stories." The #MeToo movement, which began on social media after a call to action by actress Alyssa Milano on Sunday evening, generated more than 1.3 million tweets by Wednesday morning and hundreds of thousands of posts across Facebook and Instagram, as women and men across the world continue to share stories of the sexual harassment and abuse they've faced. Similarly #YesAllWomen was tweeted more than a million times following the killing of six people in May 2014, and continues to be used. Both it and the #EverydaySexism campaign have seen spikes in use on social media since Sunday. Among the responses, there was criticism emerging about why women should feel compelled to share their stories of abuse in order to highlight the magnitude of sexual misconduct. In the US, Vox writer Liz Plank suggested there should be a shift of the burden from women to men taking accountability for their actions. Her posts on both Facebook and Twitter ended with the hashtag #HimThough generating 8,000 mentions as the discussion shifts from abuse victims to perpetrators. A written excerpt from a Ted talk by author and filmmaker Jackson Katz which was being shared before the #MeToo movement began is now being posted with the #HimThough hashtag. Another term, #HowIWillChange, has generated traction among the #MeToo response hashtags with more than 9,000 tweets, and 6,000 likes on public-facing pages on Facebook, since Tuesday morning. Australian writer and journalist Benjamin Law used it first in an online thread in which he suggested multiple ways men can change their behaviour, complicit or otherwise. 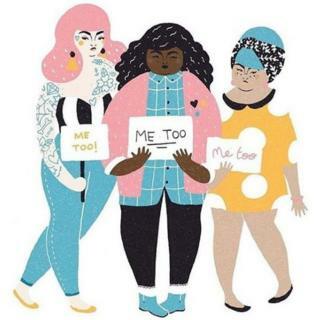 The #MeToo movement has also spread to other parts of the globe as women and men contribute to the discussion. In Arab countries the hashtags وأنا_كمان# and ‏وانا_ايضا# - which roughly translate to "me too" - have been used mostly on Facebook. In Italy, in addition to #MeToo, social media users have been posting #quellavoltache which translates to "That time that..." to describe a situation in which women and men have felt harassed or abused. It has generated more than 11,000 tweets since Milano's post. In Germany #IchAuch ("me too") is generating stories of harassment and in France users have been sharing the hashtag #Balancetonporc which translates to "rat on your dirty old man" to encourage women to name and shame their attackers. And actors and filmmakers in Nigeria's film industry have told the BBC's Pidgin language service how they have tried to push back against sexual harassment in Nollywood.